Culica is a puzzle and a multi-player game played on the surface of a 3×3×3 cube. It consists of a cube base an pegs of four different colours that click into the cube. There are many different games and puzzles that can be played on this board. If you have two or more Culicas, then you can even connect them together with the pegs to make a larger playing board. Each face of the cube consists of a 3×3 square, so there are 6·9 = 54 playing locations. Every location has exactly 4 neighbouring locations, some of which may lie on a different face of the cube. I will not describe all the different multi-player games that are possible, and restrict myself to some of the more interesting solo puzzle tasks. 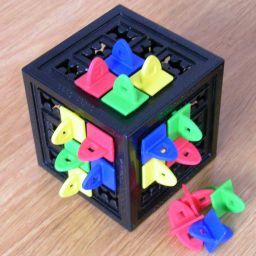 CuColours: Fill the whole cube with pegs such that pegs of the same colour are never neighbours, nor diagonally adjacent. CuSnakes: Find a snake's tour on the cube. Place the first peg somewhere on the cube. Each subsequent peg must be adjacent to the previously placed peg. Try to place as many pegs as you can before no more moves are possible. It is possible to fill the whole cube this way. If you have done that, try to make it so that the final peg is adjacent to the starting peg (for which you can use a different colour peg so as to keep track of it more easily). CuFrog: Find a frog's tour on the cube. This is like the snake's tour, but using 'frog' moves. A frog moves exactly two squares straight in any direction (but not diagonally). So between two consecutive pegs you place must lie exactly one other square, which may be empty or full. Again try to fill as many squares as possible, preferably such that the final location is a frog's move away from the first. CuKnights: Find a knight's tour on the cube. Place the first peg somewhere on the cube. Each subsequent peg must be a chess-knight's move away from the previously placed peg, that is to say that it goes two squares forward in one direction and then one square sideways (at right angles to the forwards direction). You are only allowed to go from one face of the cube to another at most once per move. An easier way to understand this is to imagine a 2x3 rectangle wrapped around the surface of the cube, and a knight move goes from one corner of this rectangle to the diagonally opposite corner. Try to place as many pegs as you can before no more moves are possible. It is possible to fill the whole cube this way. If you have done that, try to make it so that the final peg is a knight's move away from the starting peg, so that you have a 'closed' knight's tour. CuMadness: Place as many pegs as you can using the following rules: Every red peg must be next to exactly one yellow peg, no more no less. The colours of its other neighbours do not matter, and can be any number of red, green or blue. In the same way every yellow must be next to exactly one green, every green next to exactly one blue, and every blue next to exactly one red. This is remarkably difficult. CuRing: Place as many pegs as possible such that for every peg there is no peg of the same colour within the next three squares in any of the four directions. Two pegs of the same colour may be close together diagonally, but if they lie in a straight line, then there must be at least three squares between them. CuLoops Consider the loops of squares around the cube - a loop of 12 squares in a straight line going around four faces of the cube. There are 9 of such loops. Fill as much of the cube as possible with the four colours of pegs such that no loop has more than 3 pegs of the same colour. Note that this means that if a loop is to be completely filled it will have exactly three of each colour. CuLook: Similar to CuLoops, but using a single colour. Place as many pegs as possible such that every loop has at most one peg. Then try again such that every loop has at most two pegs. Then try with three, with four, etc. CuWizard: Consider four squares in a row, adjacent to each other, and crossing over an edge of the cube such that two squares are on one face and two squares on another face of the cube. There are 36 of these quadruplets on the cube. Put pegs on the cube such that as many of these quads as possible contain four pegs, one of each colour. CuNitrogen: Find a molecule consisting only of Nitrogen atoms, that is to say place pegs such that every peg has exactly three neighbouring pegs leaving its fourth adjacent location empty. Apart from the trivial empty cube, there are only two solutions. CuOxybon: Find molecules consisting only of carbon and oxygen atoms. In other words, place red pegs ('Oxygen') such that they have exactly two neighbouring pegs and two neighbouring empty locations, and pegs of any other colour ('Carbon') such that they have four neighbouring pegs. A completely filled cube would be a valid molecule containing only carbon, so let's use only molecules that have at leasy one Oxygen atom. Fill up as much of the cube as possible using one or more of these molecules that contain at least one red peg. CuOxygen: Find a molecule consisting only of Oxygen atoms, that is to say place pegs such that every peg has exactly two neighbouring pegs leaving its two other adjacent locations empty. Use as many pegs as possible to create one or more of these molecules. CuSol: Solitaire. Fill the whole cube with pegs, except for any single square. Then try to do as many moves as possible, where a move consists of jumping one peg over an adjacent peg to an empty square immediately behind that, and removing the peg that was jumped over. So each move involves three adjacent squares in a row, which start full/full/empty before the move and are empty/empty/full afterwards. Each move removes one peg, so try to do 52 moves so that only one peg remains. You can find these and other puzzle tasks on the Culica site. There are 54 locations, which each can be blank or filled with one of the four colours. This gives a total of 554 possible patterns, which is about 5.55·1037. This number is not a good indication of difficulty, as you can usually recognise a mistake early, certainly well before placing 54 pegs. It depends entirely on the rules of the particular puzzle task how early you can see mistakes. Culica, the website for this puzzle. If you put three colours in a row on any face, then the rest of the colours are forced, and that leads to a dead end. Therefore every face must have its corner squares the same colour, as well as each pair of opposite edge squares. This leaves only one solution. I decided to split it up into six congruent parts, which simplifies the problem to finding only a 9 move tour. Like CuSnakes, this construction leads to a closed tour. If a knight jumps around on a single face, it can fill everything but the centre. To get a full knights tour, I therefore decided to fill the centres first, by necessity also alternating with corners. After that, I fill the remaining squares on each face in turn. The solution is unique (except for its mirror image). Once one column is filled, there is almost no choice left if you want to fill all 48 non-centre spots. There are many other less symmetric solutions. Note however that you can also take a solution to CuRing and just fill four of the centres with one peg of each colour. It is not possible to place more than 52 pegs, because it is impossible to place more than 13 of any colour. See CuLook below for a proof. It is not possible to fill all the loops with an odd number of pegs. If there are k pegs in each loop, then there are 9k/2 pegs on the cube because each peg lies in exactly two loops. This is not a whole number when k is odd, so it is impossible to fill all the loops with an odd number of pegs. You can however fill it with (9k-1)/2 pegs in those cases. Here is another way to look at the problem. Each loop contains at most k pegs. Three parallel loops therefore contain at most 3k pegs. Let's use A to represent the total number of pegs in the front and back faces, and B the number of yellow pegs in the left and right faces. Since the front, right, back, and left faces together consist of the three horizontal loops, then there can be at most 3k pegs in those faces. In other words A+B<=3k. Let C be the total number of yellow pieces in the top and bottom faces. Looking at the other sets of parallel loops we find in the same way that A+C<=3k, and B+C<=3k. The total number of yellow pieces on the whole cube is A+B+C. The largest value of A+B+C, given that A+B<=3k, B+C<=3k, and A+C<=3k, is when the pegs are as evenly divided as possible amongst A, B and C. For even k this means that A = B = C = 3k/2. For odd k, the best we can do is A = B = (3k-1)/2 and C = (3k+1)/2. You can instead also invert the three faces used in that 2-peg solution, so that each of those three faces have two pegs in each row and column instead of just one. For a best possible solution to having at most k pegs per loop, where k is 7, 8, 9, 10, 11 or 12, just take a solution for k-6 pegs that uses only three faces and then completely fill the three empty faces. There are only 2 full solutions (up to rotation/reflection/colour-permutation). Looking only at one 2x2x2 corner, there are 6 overlapping CuWizard quadruplets. Once you choose the 3 colours to use on the three face centres, there is essentially only one way to arrange the 4th colour (as well as its mirror image). This then fully determines the rest of that 2x2x2 corner. If we choose one pair of opposite centres to have different colours, then the colours of the other face centres are forced, which in turn forces the rest of the cube. The fewest possible empty spots is 9, and this can be achieved in two ways. Start with square 11 empty.Then do the first part of the solution shown below, which clears the first three faces apart from one peg remaining at 14. Then do the two connecting moves, so that you now have a space in the last three faces at square 29. Finally do the second half of the solution, clearing those last three faces, leaving a single peg at 32 (or 29).